Since 2003, I have been cowboying and photographing ranch work from horseback on the Quarter Circle XL Ranch. 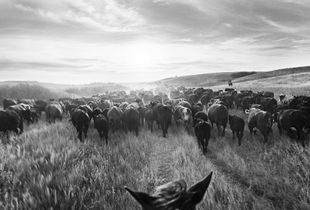 I got the adventure of a lifetime shortly after, when my photography led me to Lyle O’Bryan’s Quarter Circle XL Ranch south of Belvidere, South Dakota - where I was given the opportunity to begin work as a novice ranch hand and learn all aspects of cowboying from an old time cowboy. This is when my life and photography changed drastically - prompting the start of my long term photographic series My Ranching Life. Transitioning from portraiture against painted backdrops to documentation from horseback. Changing roles from spectator to cowboy while getting into ‘costume’ and character. I have always used my photography as a tool for attempting time travel. And working on the Quarter Circle XL Ranch is a bit like stepping back in time onto a Western movie backlot and living life within a movie. The ranch was once home to Earl Thode – first world champion bronc rider of 1929 and his family. It is quite a thrill riding across the same land and the same White River as the cowboys from the past. I feel as if I have stepped ‘inside the photograph’ - riding my Pony around and photographing in a diorama of the West somewhere between the past and present – between reality and fantasy. The ranches south of Belvidere, South Dakota are rich with western heritage – with all cattle work done on horseback. Creating quite the historical visual against the backdrop of the land and cyclorama sky. I photograph these scenes from horseback, while cowboying, with a Noblex 120 swing lens panoramic camera I carry in my saddlebags. The Noblex gives me a medium format negative suitable for large-scale printing. The panoramic format lends a cinematic quality while also conveying the vastness of the landscape. And the black & white film helps reverse time. My horse’s ears intentionally appear in some of the photographs – announcing my presence as part of the crew. These photographs are a visual diary of what appear to be ‘film stills’ of some of the many scenarios I have been a part of while learning to cowboy and eventually helping manage the Quarter Circle XL Ranch. I have had the pleasure of working alongside a crew of rugged hardworking cowboys on the ten area ranches we ‘neighbor’ with. This allows me to learn a lot, cover many miles of pasture on horseback and document within a variety of landscapes. Giving an insider’s perspective of the beauty and timelessness of present day family ranching. With photographs that, at first glance, could have been taken during another era - depicting a profession that has changed little over the past century. The land, as backdrop, has a permanence all its own, but the cast of characters are bound to change. I am proud to be a part of it all. I continue to ranch and photograph and am ever grateful to Lyle O’Bryan for being my cowboy mentor. These are the years of my life I will never forget. It has been quite the unscripted cinematic-like adventure so far.